This is a photo I have kept over the years and remember well since I was very small. It is a photo of my mother. 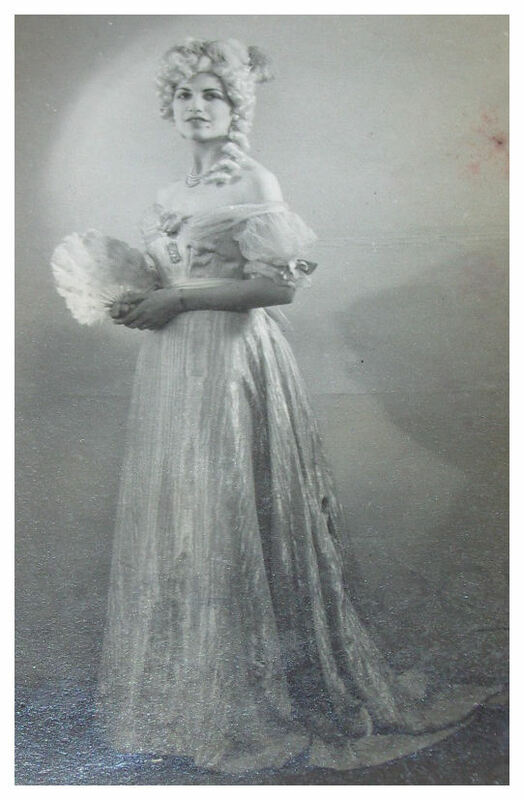 Written on the reverse of the photo is her maiden name, Sylvia Ransom, playing ‘Amelia’ from ‘The Grand Duchess’ at the Theatre Royal in 1943. That was three years before I was born and one year before she married so she would have been 21 years old in this picture and had certificates from the ‘Royal College of Music’ for her soprano voice. I have no clear memories of the Theatre Royal myself, although I know I have been there for shows in my youth several times. These visits would have been mainly for Gilbert and Sullivan operettas. My parents were both involved in from 1931, when my father joined the Lewes Road Operatic and Dramatic Society at the age of seventeen, following on from Boys Brigade. Mum joined later when she and dad met. Mum was a hairdresser by trade and would have known how to work with the hot curling irons on the wigs, like the one in the picture. Many times the trunks of clothes sent were from the theatrical wardrobe companies. This meant the clothes and wigs needed that little bit of a spruce up, and mum was good at the hair side of things. She was also a make-up artist so she could assist the ladies and the gentlemen with their facial needs be it a rosy glow for the young maidens, or several ageing lines and some crows feet for the more featured parts. The theatre then was such an exciting experience. Getting all dressed up to go out of an evening, winter or summer, and meeting people you know well all sporting best costume jewellery and polished shoes. Felt quite important to a wee girl like me at ages from 6/7 onwards. Do you have memories of the Theatre Royal? I would love to hear from others of any memories about the Theatre Royal. Live theatre has such an interesting atmosphere and of course subject to the events of the night. No good if the prompt fell asleep.